BioPro IEX Columns are for the separation of proteins, peptides, and nucleic acids. BioPro IEX Columns are available in QA and SP chemistries and are based on porous (QA and SP columns) and non-porous (QF and SF columns) hydrophilic polymer beads with low nonspecific adsorption. The porous materials offer excellent binding capacity with exceptionally high efficiency. The non-porous particles offer high efficiency and exceptional resolution. 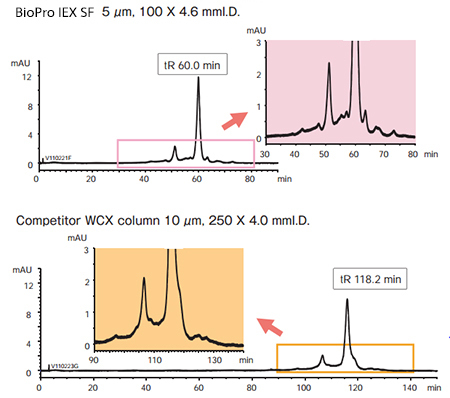 The separation of MAb is compared on SCX (BioPro IEX SF) and WCX (competitor’s) under the same gradient conditions at pH 5.6. BioPro IEX SF column provides higher resolution of MAb in a shorter analysis time than the competitor's column. 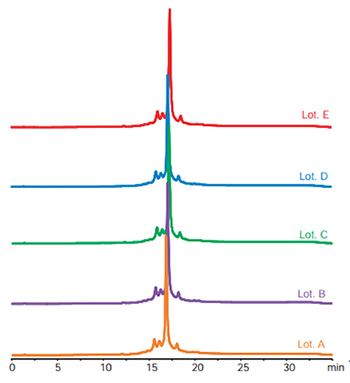 BioPro IEX SF column exhibits excellent batch-to-batch reproducibility for MAb analysis, including the resolution of peaks for small charge variants. All the gel batches are inspected by various quality control tests, including HPLC analysis of MAb, and must pass rigorous criteria before release. BioPro IEX Columns are the best choice for the quality control of MAb and other biopharmaceuticals. : BioPro IEX SF 5 μm, 100 X 4.6 mmI.D. The separation performance of non-porous and porous columns for proteins is compared. BioPro IEX Colomn non-porous types are effective for high-throughput analysis at a high flow rate because of its high mechanical strength and high column efficiency. Compared with conventional porous-polymer anion-exchange columns, BioPro IEX QA has a superior DBC. Furthermore, its recovery is greater than that of conventional columns. The hydrophilic properties of the matrix polymer remarkably reduce the nonspecific adsorption of proteins on BioPro IEX columns. : BioPro IEX QA 50 X 4.6 mmI.D. Brand T (porous Q Type) 50 X 4.6 mmI.D. Brand G (porous Q Type) 50 X 5.0 mmI.D. 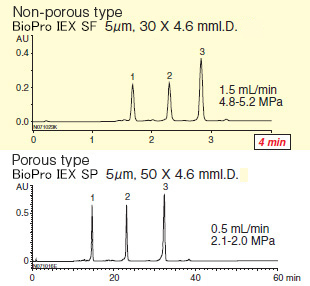 BioPro IEX QA shows the excellent peak shapes even when the loading amount increases. By contrast, the column of Brand G cannot achieve acceptable peak shapes and resolution even in small amount of injection.